An 82-year-old female sustained a ground level fall after missing a single step while Christmas shopping. She arrived at the emergency department with stable vital signs, but with massive facial bleeding threatening her airway. We proceeded with emergent nasal packing and endotracheal intubation. 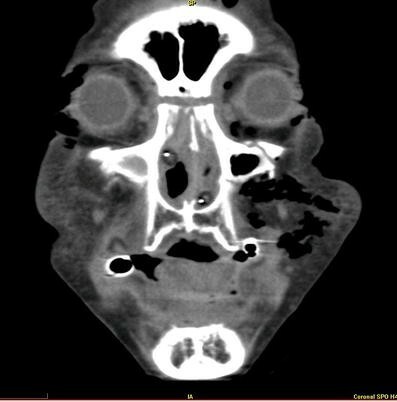 CT of head and face revealed massive pneumoencephalus (Fig. 1) secondary to complete disruption of the facial complex from the cranium, consistent with LeFort I, II and III fractures (Fig. 2). 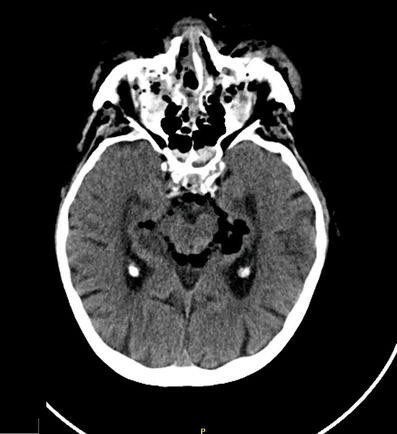 The patient was taken to surgery and subsequently extubated on day 2 without neurological deficit.